Teachers in the Los Angeles Unified School District have taken their first formal step toward a possible strike in the coming school year. The last L.A. Unified teachers strike was in 1989. United Teachers Los Angeles leaders said officially Monday that — after more than a year at the bargaining table — contract talks between LAUSD officials and the teachers union had reached an "impasse." District officials disputed the claim that negotiations had reached impasse. In a statement, deputy superintendent Vivian Ekchian said the two sides had scheduled another bargaining session for later this month "and neither had previously indicated there was no room for movement." A strike is still a ways off. The union's declaration of an impasse now gets a state labor relations board involved and could start a weeks- or months-long process of mediation. This move means that United Teachers Los Angeles believes further un-mediated talks with the district would not result in a new contract. Among the sticking points: salaries, class sizes, caseloads for special education teachers and other issues. It's also a sign that the union is escalating its showdown with the district's new superintendent, Austin Beutner, as well as the four L.A. Unified school board members endorsed by pro-charter school groups. 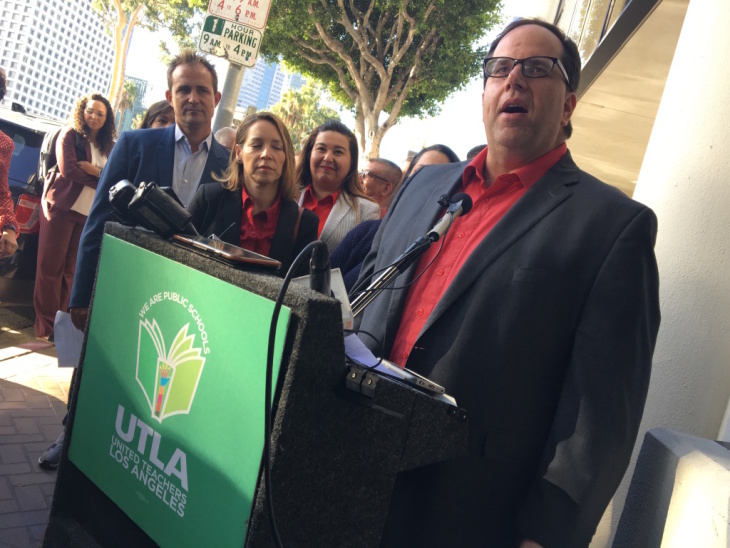 "UTLA has attempted," wrote union executive director Jeff Good in the union's impasse letter, "to engage the district in a thoughtful and progressive bargaining relationship that paves the way toward a better future for LAUSD, but it's become increasingly clear that the current board majority, along with their handpicked superintendent, has a different goal." The escalation also puts two very different narratives about the school district's present financial health on a collision course. According to L.A. Unified budget officials, the district's finances are increasingly precarious. The reasons they cite? Declining enrollment and mounting costs for employee benefits. Some members of that school board majority have even raised the specter of insolvency for the district. But union leaders disagree. They say district leaders are overplaying LAUSD's financial challenges and, in the impasse letter, argue "the board majority has taken actions to accelerate the loss of students." This post was updated at 3 p.m. to include LAUSD's statement.